While securing a screener and finalizing info on opening dates, the phrase How to Make Money Selling Drugs found its way into many of my email subject lines. Hopefully the NSA and DEA don’t come calling, but if they do, I have a fascinating movie to recommend. 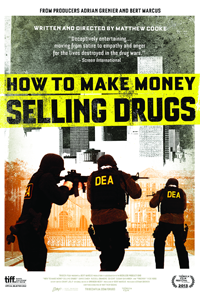 Matthew Cooke’s documentary on the cost of America’s War on Drugs is not the smug expose the title suggests. Cooke expertly molds his impressive pool of data into this sardonic shell, offering lessons to lead you to the success the title offers. What he’s actually done with all these clearly labeled nuggets embedded in well-defined categories is outline a comprehensive look at our drug culture. Data-dense and expansive, How To quickly separates itself from the recent glut of drug-related docs. Cooke does not simply recommend legalization, noting the tax benefit and lessening crime that came from striking down Prohibition. Indeed, Cooke does not do anything simply. He emphasizes the genuine danger of drug use as one of many related crises being improperly addressed because of the nation’s crime and punishment attitude. There’s the underlying racism in the basis and execution of the laws. Don’t forget the enforcement incentivizing, which creates an overzealous police force. And of course, there’s the simplicity in the facts of supply and demand. Cooke covers it all, and does so with richly textured, strangely entertaining narratives. We hear from nearly every type of stakeholder: dealers, kingpins, police officers, informants, ex-DEA, politicians, lawyers, academics, and that guy who wrote The Wire (David Simon – disturbingly informative). While they may not all agree on the nuance of the issues, they paint a picture of a dangerously wrong-minded approach to the problem. And Cooke is not satisfied to simply provide anecdotal evidence and opinion. This is not Fox News, after all. Rather, he populates his brisk 90 minutes with enough clarity, data and statistics on every imaginable front that it’s hard to believe his film is as engaging and entertaining as it is. Thank the candor of Cooke’s subjects, and his own directorial skill.